After my recent angioplasty, I’ve been vigilant about protecting my heart. 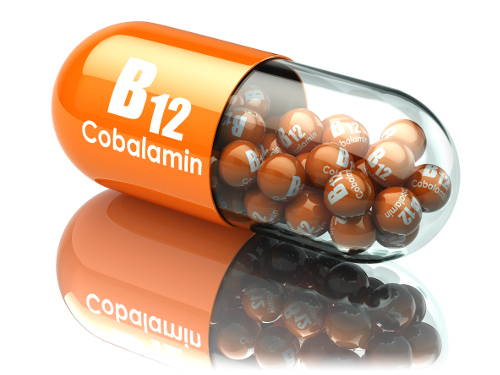 And in my search for better heart health, I’ve found some exciting news about vitamin B12, also known as cyanocobalamin. Vitamin B12 is responsible for the smooth functioning of several critical body processes, and plays a huge role in energy production, digestion, and neurotransmission. But it was its role in heart health that caught my eye. Apparently, this all-important vitamin fights against what could be a big enemy of the heart: homocysteine. Homocysteine is an amino acid that is produced in the body as a result of protein metabolism. Although homocysteine is naturally found in the body, studies suggest that having too much in the blood can cause fatty buildups in the arteries, and increased blood pressure. And this is where vitamin B12 may help. Having adequate levels of vitamin B12 in your system will help keep your homocysteine at a safe level. The vitamin works alongside vitamin B6 and folic acid to break down the homocysteine in your bloodstream. Like most vitamins, B12 can’t be made by the body. Instead, it must be absorbed from food. And to add to the problem, plants don’t make vitamin B12. The only food sources of B12 are meat (especially red meat), eggs, poultry, dairy products, and other foods from animals. However, the best source of vitamin B12 is cooked organ meats—like beef, lamb, or veal liver and kidney. While shellfish like crab, oyster, and mussels are a good source of the vitamin, the content is nowhere close to that of red meat. To give you a comparison, 75 grams (g) of organ meat gives you 52 to 66 micrograms (mcg) of vitamin B12. The same amount of cooked shellfish gives 13.2 to 21.6 mcg of vitamin B12. And other popular seafood like tuna and salmon yield just 2.3 mcg per 75-gram serving. As for vegetarians and egg lovers, the news is also not great. Two large, cooked eggs will give you just about 1.5 to 1.6 mcg of vitamin B12. A full glass of milk gives you about 1.5 mcg of vitamin B12. And, as all dairy products derive from milk, unless they are fortified with vitamin B12, you get the same low dose. If you’re like me and are staying away from red meat because of cholesterol concerns, or if you’re a strict vegetarian or a vegan, your best bet for getting vitamin B12 is to supplement with oral tablets or gels or try fortified plant-based foods. But for all you healthy, lean meat-eating people out there, you can make vitamin B12 your excuse for firing up that barbecue. Having said that, choose low-fat red meats like bison, venison, or even ostrich to help your body fight off a potential danger to your heart. The key, as with most foods, is to eat them in moderation. “Vitamin B12,” National Institutes of Health Office of Dietary Supplements; https://ods.od.nih.gov/factsheets/VitaminB12-HealthProfessional/, last accessed July 12, 2017. “Food Sources of Vitamin B12,” Dietitians of Canada, March 7, 2017; https://www.dietitians.ca/Your-Health/Nutrition-A-Z/Vitamins/Food-Sources-of-Vitamin-B12.aspx, last accessed July 12, 2017. Chaava, M., et al., “Homocysteine as risk marker of cardiovascular disease,” Georgian Medical News, Oct. 2005; (127):65-70; https://www.ncbi.nlm.nih.gov/pubmed/16308448, last accessed July 12, 2017. Guthikonda, S., et al., “Homocysteine: role and implications in atherosclerosis,” Current Atherosclerosis Reports, Mar. 2006, 8(2):100-6; https://www.ncbi.nlm.nih.gov/pubmed/16510043, last accessed July 12, 2017. Ekue, A., “List of Lean Red Meats,” Livestrong, January 9, 2014; http://www.livestrong.com/article/248748-list-of-lean-red-meats/, last accessed July 12, 2017.